It was a cold and blustery afternoon in early October when we set out as a family into the busy core of Vancouver, on a mission: to create a short video to illustrate the ease of using the Find Chocolate! app. Our intrepid teenagers good-naturedly came along to haul camera gear, and we set up at a busy intersection near Mink Chocolates. This was for two very good reasons – we needed a busy intersection in order to shoot a time-lapse sequence, and of paramount importance, Mink makes a fantastic drinking chocolate spiced with chili, which we all knew we would need by the time we wrapped. There followed an hour of me standing on one corner, holding the iPhone in my gloved hand, while director/videographer/Robert stood on the Kitty Corner with camera and elder son keeping lookout, so passers-by wouldn’t knock the camera over. I had to keep very still to make the time-lapse sequence work – and I just kept getting colder and colder. Younger son took on the Production Assistant position, running back and forth between me with requests from the director. That wrinkled brow you see in the video reflects less concern about finding the shop (those directions are as clear as a bell), and is more to do with my chilly toes cramping up. All went well, we got the footage required, retired to Mink for a well-earned hot chocolate, and made our way home, congratulating ourselves on a family outing and a job well-done. In the editing process Robert discovered that I was wearing my gloves in the long shot, and had taken them off for the close-ups of the phone – it is impossible to make the phone’s touch screen work through gloves. My bad – I should have remembered – I am usually good at continuity. I once again blame the cold! No worries. We returned to the scene a few days later, and shot a glove removing scene, which Robert then edited together seamlessly with the original footage. He is quite brilliant and saved the day, and the video. 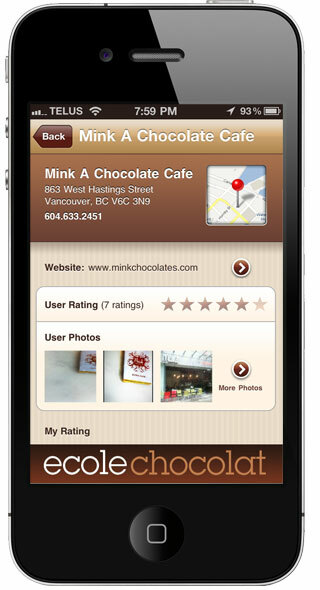 And now, I am going to put the app to good use, and aim for the chocolate shop closest to our house. I hope you enjoy!